We are very sad to report the death of the American poet Samuel Menashe. He died on Monday night (22nd August), peacefully, in his sleep. He was frail and weak but lucid until the end. There will be a quick burial service following Jewish custom and a larger memorial service most likely in October at the New York Public Library. Samuel Menashe was born in New York City in 1925, the son of Russian-Jewish immigrant parents. He served in the US infantry during the Second World War, and afterwards studied at the Sorbonne in Paris. He returned to New York in the 1950s where, apart from frequent sojourns in Britain, Ireland and Europe, he lived in a tiny "cold water" apartment until a year and a half before his death – at the age of 85 – in 2011. He was first published in Britain, thanks to Kathleen Raine, in 1961, before he achieved any recognition in America, where he remained a marginal figure over five decades. 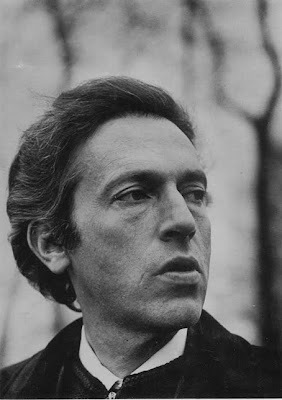 In 1996 a selection of his work was published in the Penguin Modern Poets series. In 2004 he became the first winner of the Poetry Foundation’s Neglected Masters Award, a prize that both paid tribute to his excellence and made reparation for the years in which his achievements were overlooked. 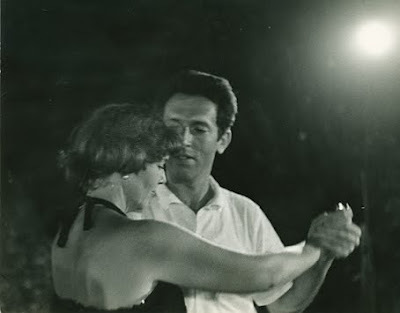 Don Share has just published an obituary on the Poetry Foundation's website. His New and Selected Poems, edited by Christopher Ricks, was published by the Library of America in 2005. An expanded edition, published with Life Is Immense: Visiting Samuel Menashe, a film on DVD by Pamela Robertson-Pearce, was published by Bloodaxe Books in 2009. Samuel Menashe’s poetry has a mysterious simplicity, a spiritual intensity and a lingering emotional force. For over 50 years he practised his art of ‘compression and crystallisation’ (in Derek Mahon’s phrase) in poems that are brief in form but profound in their engagement with ultimate questions. 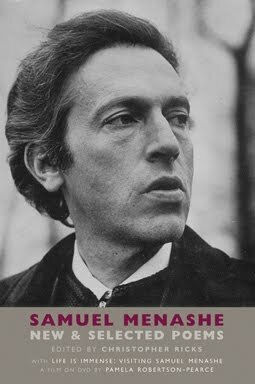 As Stephen Spender wrote, Menashe ‘compresses thought into language intense and clear as diamonds’. Intensely musical and rigorously constructed, Menashe’s work stands apart in its solitary meditative power, but it is equally a poetry of the everyday. The humblest of objects, the minutest of natural forms, here become powerfully suggestive, and even the shortest of the poems are spacious in the perspectives they open. These are religious poems. They are, in particular, the poems of a Jew, not a Hebrew speaker, but one whose holy book is the King James Version of the Jewish Bible. They are not doctrinally Jewish, nor are they exclusive in their sense of holiness. They are imbued with a sense that - in the words of William Blake, a poet who looms large in Menashe's pantheon - 'Everything that lives is holy'. 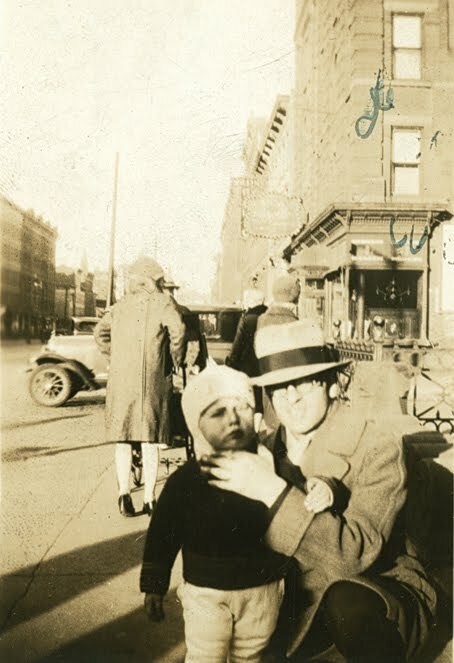 Samuel Menashe with his father, New York City, 1920s. 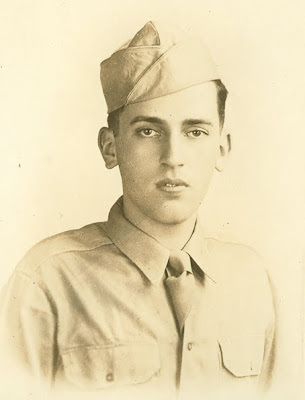 Samuel Menashe experienced the Battle of the Bulge in 1944 as a runner for the US infantry. Picture taken after the war. 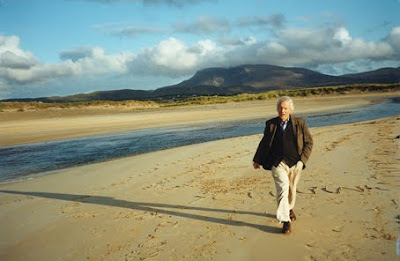 Samuel Menashe, in his later years, during a visit to the west coast of Ireland. Photo: Martin Duffy. 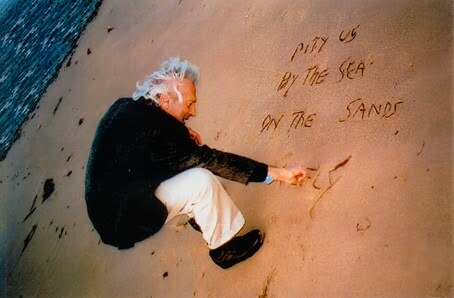 Samuel Menashe in Ireland, writing one of his short poems in the sand: 'Pity us / By the sea / On the sands / So briefly'. Photo: Martin Duffy. Samuel Menashe at the grave of W.B. 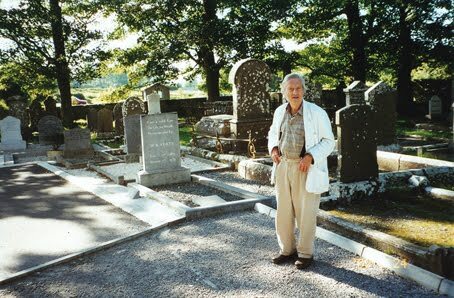 Yeats at Drumcliff near Sligo in Ireland. The epitaph on Yeats's headstone is taken from the last lines of his poem 'Under Ben Bulben': 'Cast a cold Eye / On Life, on Death. / Horseman, pass by!' Photo: Martin Duffy.